Blonde Brownies, AKA Blondies are a simple, easy rich dessert recipe. Similar to the classic chocolate brownies, Blondies are flavored vanilla instead of chocolate. Add in Chocolate chips for a fun twist, serve with ice cream or leave plain! 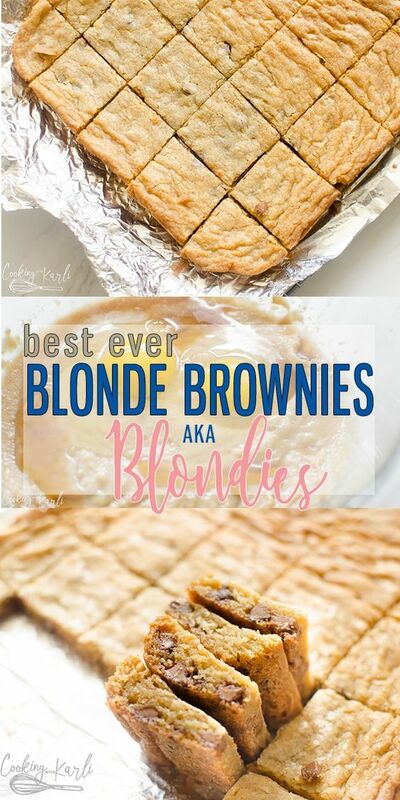 This is the best Blonde Brownie Recipe around! Combine the melted butter and sugars in a medium sized bowl. Add in the eggs and vanilla. Mix well. Add in the salt, baking soda, and flour. Mix until just combined. Remove from the oven, cool completely. Pull the blondies out of the pan using the aluminum foil once completely cool. Slice and serve.